Greetings from The Wrigley Institute for Environmental Studies! It is currently week 9 of the REU (Research Experience for Undergraduates) program. I cannot believe this summer has gone by so fast. It feels like just yesterday I was getting on the Miss Christi for the first time with all the other REUs, many of them still strangers to me. Coming to Catalina for the first time, I did not know what to expect when we first arrived. 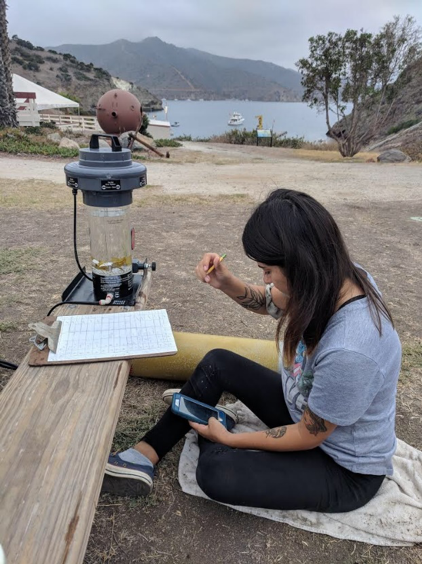 I quickly learned that Catalina Island is a warm and welcoming place that supports students by allowing them to pursue their interests while also having fun! 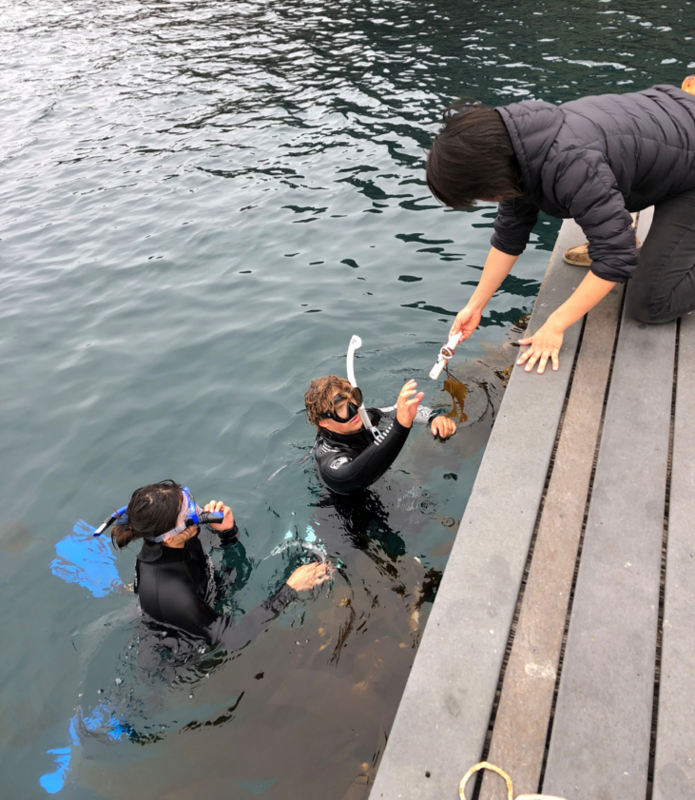 My research partner, Tristan Jordan-Huffman, and I out planting some juvenile kelp into Big Fisherman’s Cove with the help of our mentor Diane Kim. My summer research project is a part of a bigger project at Wrigley that is attempting to grow and use kelp as a source of biofuel. This project is funded by The Department of Energy, more specifically the Advanced Research Projects Agency. Both USC’s Wrigley Institute for Environmental Studies and Marine BioEnergy, Inc. are participating in this research. My project relates directly to an aspect of the Kelp Biofuel project called “depth cycling.” Depth cycling would allow kelp to be close to the surface of water, receiving sunlight for photosynthesis during the day, and moving to lower depths at night to receive nutrients. This picture shows the set up for the Catalina Hyperbaric Chamber experiment. Milena and I set up two aquariums and weighed down kelp to expose it to pressure. 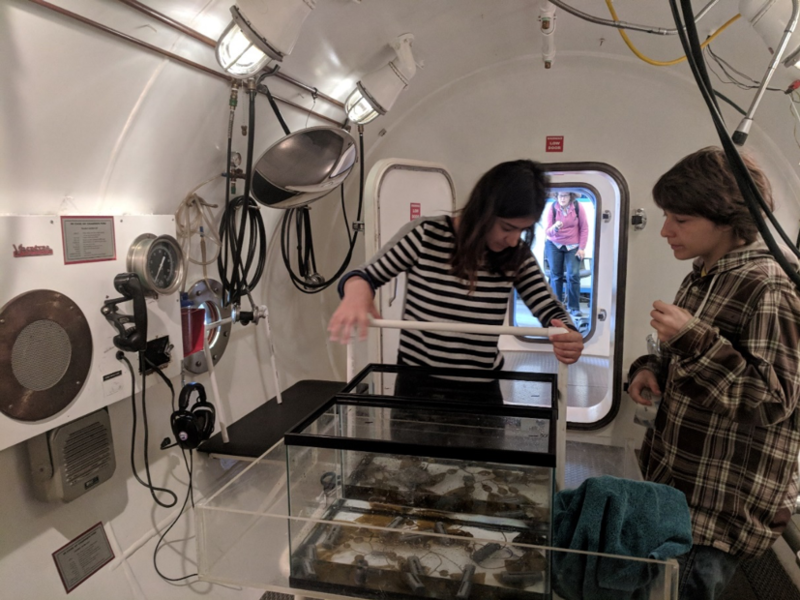 In order to attempt to answer these questions I used the Catalina Hyperbaric Chamber to expose fully-grown kelp individuals to pressure, as well as a mini pressure chamber to expose juvenile kelp to pressure. This past week I have been wrapping up my experiments and focusing on data analysis. Data analysis has always been a little tough for me, but I’m fortunate to have my mentors Andy and Diane helping me through it all. 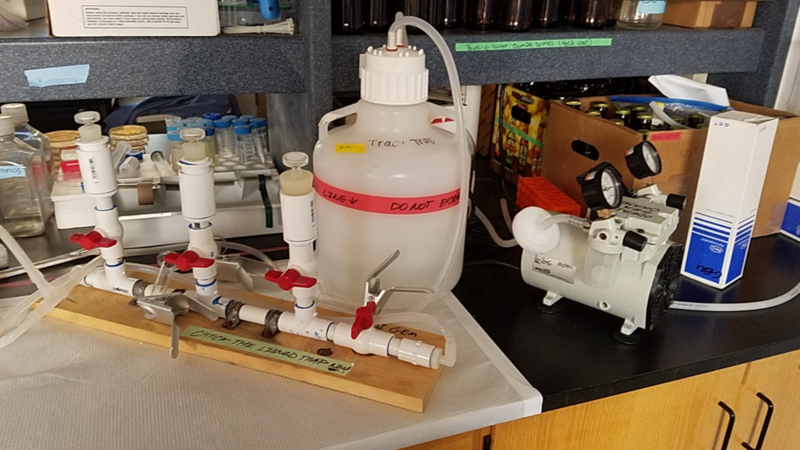 This is a picture of my second experiment involving a mini pressure chamber that would expose juvenile kelp to pressure every day. Although this past week has been filled with endless data input, graph making on Excel, and scientific poster making, I took a little time off and went for a 2-mile run to Two Harbors! I joined Callie and Kent on their daily run to be a little active during this busy week. Of course, it is not a complete trip to Two Harbors if you don’t get an ice cream sundae while you’re there! 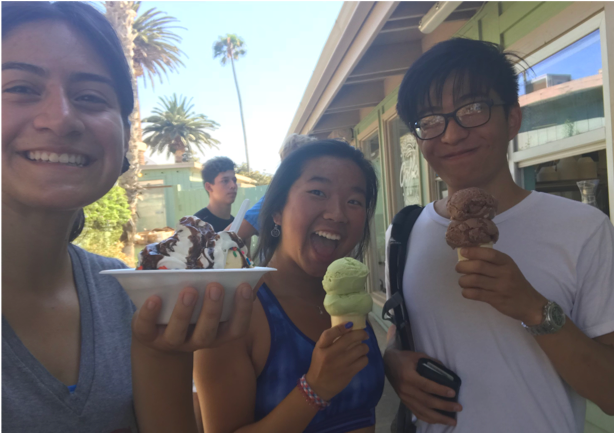 Callie, Kent, and I enjoying some ice cream after our two-mile run. One of the last things the REU cohort plans to do together is camping! We will be hiking from Two Harbors to Shark Harbor, a 4.5 mile hike, and camping overnight on the beach! I’m really excited to have some last-minute fun with the whole group before we all go our separate ways for the upcoming semester. I’m really sad that we only have a week left together on the island. Coming to Catalina with 11 other strangers was a little scary at first, but after spending time together, I realized that we are more than a friend group – we have become a family and I’m so grateful to have had this opportunity with each and every one of them! I can’t say this enough, but this summer was one of the best I’ve ever had and I owe it all to the USC Wrigley Institute for Environmental Studies, The National Science Foundation, and everyone who made this REU experience possible! This entry was posted in Undergraduate, Wrigley Institute on August 1, 2018 by Jessica Dutton. Hey there! My name is Kent and I’m checking in from the NSF-funded USC Wrigley Marine Science Center’s REU program. Every day is filled with something fun – from dancing in town on Friday nights to trips into Avalon. Between all the fun activities, it may look hard for us to tear ourselves away and work in a lab; however, that could not be more incorrect. Everyone has exciting projects to work on and I have the pleasure of working with Dr. John Heidelberg and Elaina Graham on studying aerobic anoxygenic photoautotrophs. Aerobic anoxygenic photoautotrophs is a bit of a mouthful so I’ll be referring to them from here on out as AANPs. AANPs are bacteria that can use light to turn carbon dioxide into sugar, survive in the presence of oxygen, but do not produce oxygen themselves. On paper it sounds simple and easy but in practice, AANPs have not been studied due to all the conditions that would have to be met to classify them as such. However, a recent study led by Elaina Graham has suggested the widespread prevalence of AANPs in marine environments. Metagenomic data from the TARA oceans project reveals that AANPs are found around the globe at an average depth of five meters. 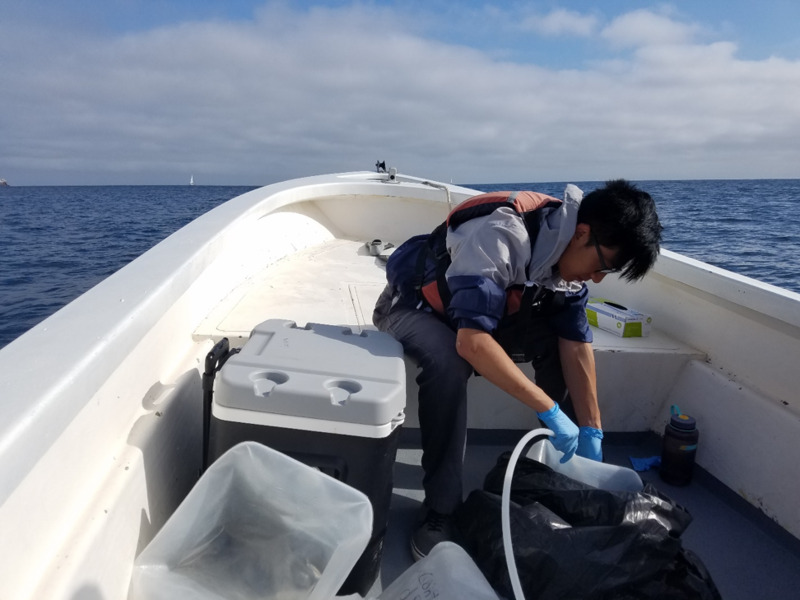 To study this class of bacteria, water is pumped from the ocean surrounding Catalina Island. To perform sampling, I take a boat out to different areas around the island and use a pump to draw water from around five meters. Once the water is taken back to the lab, thiosulfate is added to the samples as evidence has suggested its role in the metabolic pathway of most AANPs. The samples are then incubated under infrared light to promote the growth of AANPs and suppress the propagation of chlorophyll-based bacteria. These samples are then filtered and analyzed via DNA extraction and cell counts. Based on the amount of DNA present and the ratio of AANPs to chlorophyll-based bacteria, changes to the experimental set up can be made. The goal is to be able to determine a method of consistently enriching AANPs to a level where they can then be easily studied. If the enrichment goes well this summer, we hope to be able to quantify the exact amount of carbon fixed by AANPs worldwide to better understand how carbon dioxide can be taken out of the atmosphere by bacteria. Though the summer may be running out, there’s still plenty of science to do, both on this project and some ones you’ll hear about from other REU students! This entry was posted in Undergraduate, Wrigley Institute on July 31, 2018 by Jessica Dutton.